This month I am attempting to make desserts inspired from ingredients out of my garden. Truth be told, this is the first year that I have ever really planted vegetables and herbs and actually looked after them. So for the last two months I have been tending to the garden, by watering, pulling out weeds and maintenance. With my busy, crazy and sometimes stressful jobs ( I have five at the moment), I actually find gardening very peaceful and relaxing. Anyways, Since the zucchini was the first vegetable to really be ready for the picking, I decided to make a simple, yet comforting zucchini cake. 1. Preheat oven to 350 degrees F and place rack in center of oven. Grease (or spray with a nonstick vegetable spray) a 9 x 9 inch pan. Set aside. 2. Toast the pecans for about 5-10 minutes or until lightly browned and fragrant. Let cool and then chop coarsely. 3. Grate the zucchini, using a medium grater, and then peel and grate the apple. Set aside. 4. In a large bowl whisk together the flour, baking soda, baking powder, salt, ground cinnamon, and nutmeg. Set aside. 5. In a large bowl beat the oil, sugar, eggs, and vanilla extract until well blended. Beat in the grated zucchini and apple. Add the flour mixture, beating just until combined. Then fold in the nuts and coconut. Scrape the batter into the prepared pan and bake until the bread has risen and a toothpick inserted in the center comes out clean, about 40-50 minutes. Place on a wire rack to cool for 10 minutes, then remove the cake from the pan. 1. In a food processor, process the butter and cream cheese until very smooth with no lumps. Gradually add in the powdered sugar until fully incorporated and smooth. Add in the vanilla extract. Spread over the top of the cooled zucchini cake. 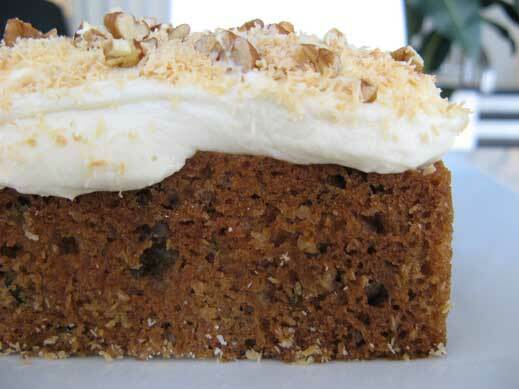 Add toasted coconut and toasted pecans for a more finished look. This summer I decided that I would learn how to can. I love the idea of being able to preserve fruits and vegetables at their peak and open them up on rainy days. Canning is something that I have always been intrigued by and this year seemed as good as any year to learn how. Armed with the Joy of Canning and a binder full of research and recipes, I began a process of processing. 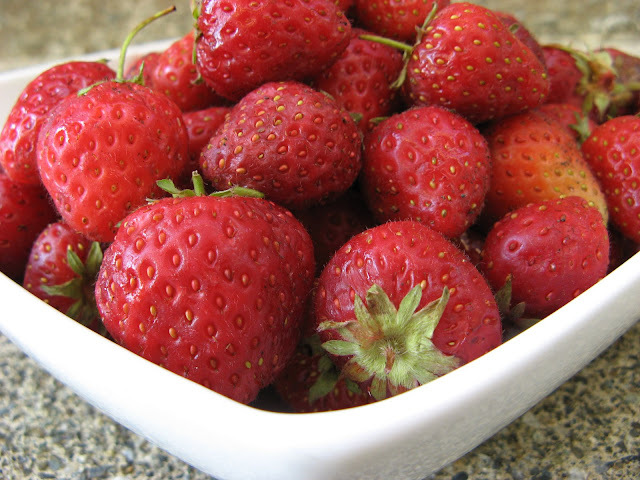 The idea of canning first came when my friend Elana invited me to go strawberry picking with a group of friends. We ended up picking so many strawberries, the obvious thing to do, was to make jam. 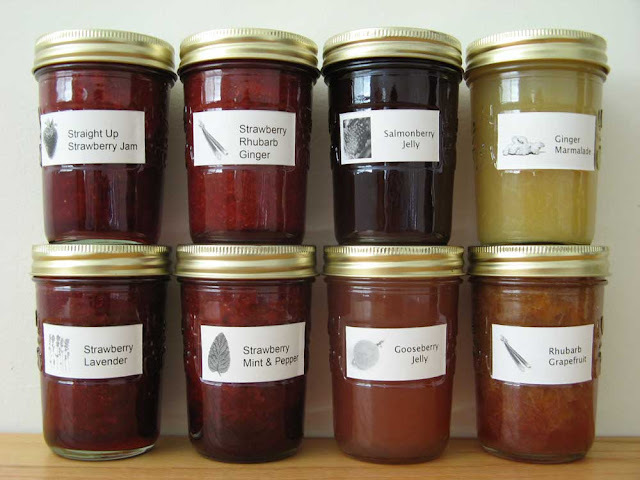 The very next day, Elana and I decided to make a variety of strawberry jams. We made straight-up strawberry, strawberry-lavender, strawberry-mint & black pepper and strawberry-rhubarb-ginger. Our first attempt at making the jam was not the success either of us had anticipated, the jam was a little too sweet and did not set properly. Our second attempt resulted in a much more palatable array of jams. My second canning experience came after a weekend camping trip with my good friend Mie. During our camping trip Mie and I came across a bunch of salmonberry bushes. We picked the berries, having in my mind that I might be able to make salmonberry jelly. On our way back to the city, we also picked up a large basket of gooseberries from a roadside fruit stand. Not knowing what to do with the gooseberries, I decided to make jelly out of that too. My third experience with canning came when I came across some fresh rhubarb and ginger at the Trout Lake Farmers Market in Vancouver. Rhubarb and ginger are actually two of my favourite flavours so it made perfect sense that I make preserves and marmalade out of these as well. I think by my third experience with canning, I definitely feel more comfortable with the process. I am definitely still a beginner with this, but I look forward to more seasonal fruits and vegetables to can and preserve this summer. I also want to thank, all the individuals who have sampled my jams, gave me their feedback and for taking some of it off my hands. As you can imagine, one person can’t eat that amount of jam that I produced in a two-week span, no matter how good it is! This month's Sugar High Friday is hosted by the lovely and talented Tara of Seven Spoons. For this month's SHF #31 Tara asked food bloggers to meditate on the idea of using "Shades of White". As Tara writes "Participation is simple; make a dessert featuring your chosen hue of white. Anything from the palest of champagne ices to frothy zabaglione to the barest tan of hazelnut cookies. Or let the character of form inspire; are you drawn to the simple elegance of blancmange, or the childhood taste of marshmallow, or the towering excess of a meringue crowned pie? The possibilities are endless." Pour 2 tablespoons of water into a small bowl. Sprinkle gelatin over water. Let it stand until softened, about 5 minutes. Combine heavy cream, milk, sugar and the grated tonka bean in a saucepan, and place over medium heat. Let the grated tonka bean infuse in the cream for at least 5 minutes. Bring the mixture to a boil and then take it off the heat. Add the softened gelatin and mix until the gelatin has dissolved. Strain through a fine chinios/strainer into a new bowl and discard the grated tonka. Chill over an ice bath just until cool. Pour into small moulds, bowls, glasses or ramekins and chill for at least 3 hours. Makes approximately 8, 1/2 cup servings. It is probably a good idea to make this a day ahead as gelatin never sets as quickly as we might wish. 1. 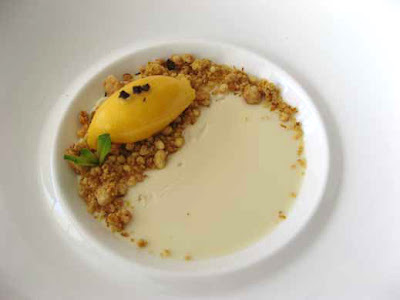 Purchase good quality ingredients, as there are usually only 3-5 of them in a panna cotta. 2. The exact amount of gelatin is crucial! If you add too much, you will have the consistency of jello, and if you add too little, you will have a limp liquid cream. The consistency should be a soft, silky cream that is slightly set, almost too delicate to handle. 3. If you are de-moulding the panna cotta, dip the mould in warm water to release it. If the water is too hot, the panna cotta will melt. When de-moulding, take your time, be gentle, and carefully loosen the edges with slightly wet fingers so that you can wiggle it out. 4. If you are de-moulding your panna cotta, make some tuile cookies in the shape of the base of your pannacotta (e.g. if you are making a round panna cotta, make circle tuile cookies). Place the cookie on the bottom of your panna cotta so that, when you invert the mold, the panna cotta rests on the cookie. This will help you transfer the panna cotta onto the plate without denting or destroying the delicate and silky cream. The cookie will also give you a nice crunch, which will provide contrast to the softness of your panna cotta. 5. If you are wanting to pair a jelly or fruit with your panna cotta, pick a flavour that will compliment, stand up to or help cut the intensity of this creamy dessert.